We and all other animals wouldn't be here today if our planet didn't have a lot of oxygen in its atmosphere and oceans. But how crucial were high oxygen levels to the transition from simple, single-celled life forms to the complexity we see today? "The oxygenation of the deep ocean and our interpretation of this as the result of a rise in atmospheric O2 was a pretty late event in the context of Earth history," said Daniel Stolper, an assistant professor of earth and planetary science at UC Berkeley. "This is significant because it provides new evidence that the origination of early animals, which required O2 for their metabolisms, may have gone on in a world with an atmosphere that had relatively low oxygen levels compared to today." He and postdoctoral fellow Brenhin Keller will report their findings in a paper published in the journal Nature. Keller is also affiliated with the Berkeley Geochronology Center. Tracking the concentration of oxygen in the ocean and atmosphere over Earth's 4.5-billion-year history, however, isn't easy. For the first 2 billion years, most scientists believe very little oxygen was present in the atmosphere or ocean. But about 2.5-2.3 billion years ago, atmospheric oxygen levels first increased. The geologic effects of this are evident: rocks on land exposed to the atmosphere suddenly began turning red as the iron in them reacted with oxygen to form iron oxides similar to how iron metal rusts. Earth scientists have calculated that around this time, atmospheric oxygen levels first exceeded about a hundred thousandth of today's level (0.001 percent), but remained too low to oxygenate the deep ocean, which stayed largely anoxic. "Filling in the history of atmospheric oxygen levels from about 2.5 billion to 400 million years ago has been of great interest given O2's central role in numerous geochemical and biological processes. For example, one explanation for why animals show up when they do is because that is about when oxygen levels first approached the high atmospheric concentrations seen today," Stolper said. "This explanation requires that the two are causally linked such that the change to near-modern atmospheric O2 levels was an environmental driver for the evolution of our oxygen-requiring predecessors." Stolper and Keller hoped to pinpoint a key milestone in Earth's history: when oxygen levels became high enough - about 10 to 50 percent of today's level - to oxygenate the deep ocean. Their approach is based on looking at the oxidation state of iron in igneous rocks formed undersea (referred to as "submarine") volcanic eruptions, which produce "pillows" and massive flows of basalt as the molten rock extrudes from ocean ridges. Critically, after eruption, seawater circulates through the rocks. Today, these circulating fluids contain oxygen and oxidize the iron in basalts. But in a world with deep-oceans devoid of O2, they expected little change in the oxidation state of iron in the basalts after eruption. "Our idea was to study the history of the oxidation state of iron in these basalts and see if we could pinpoint when the iron began to show signs of oxidation and thus when the deep ocean first started to contain appreciable amounts of dissolved O2," Stolper said. "This work indicates that an increase in atmospheric O2 to levels sufficient to oxygenate the deep ocean and create a world similar to that seen today was not necessary for the emergence of animals," Stolper said. 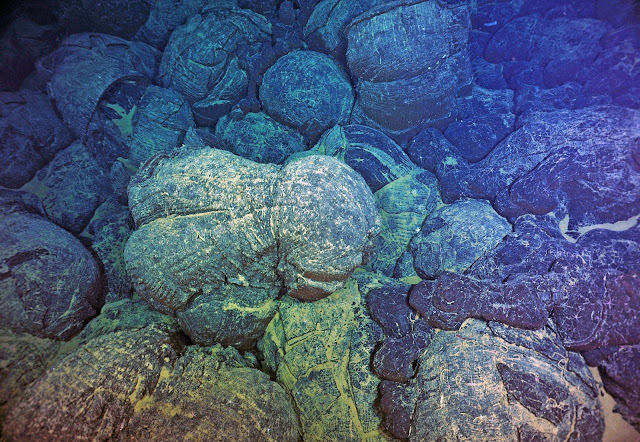 "Additionally, the submarine basalt record provides a new, quantitative window into the geochemical state of the deep ocean hundreds of millions to billions of years ago."